The Havaianas Origine Sneaker II Espadrille (men) is from its relaunched Soul Collection). Photo from Havaianas Web site. IT is lightweight, sports a canvas upper, cushioned footbed with textured rice pattern and detailed stitching. One more clue: it has a rubber flip flop sole. If you guessed the Origine Sneaker II Espadrille from Havaianas, kick up your heels! The Brazilian maker of the famous flip flop has relaunched its closed-toe Soul Collection. 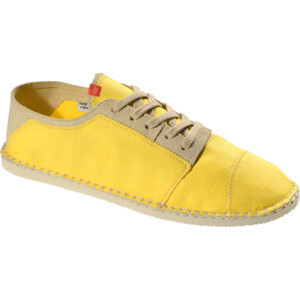 Aside from the aforesaid sneaker, it spans nine other espadrille styles for men and women ($38-$54). They were on view recently during a press preview at New York City's Dream Downtown Beach venue. A Havaianas storyboard, including styles (women) from the Flat Collection. Photo by Yours Truly. Now that the warm weather is finally breaking, at least in the Northeast, Havaianas Soul is ready to take it to the streets. Ditto for the more familiar flip flop. Speaking of, there is news in that corner, too – specifically the Flat Collection. These styles were also no view for members of the press, some of whom (including Yours Truly) availed themselves of a pair, plus a complimentary pedicure. Flip flop lovers will be hardpressed to choose just one style. At $18-$22, they won't break the bank if a buyer procured two or six pair in eye-catching solids, two-tones and print: florals, geometrics, animal prints and animal paw. Made with the signature Havaianas rubber sole, Flat Collection styles are distinguished by a shorter strap. Notably, they are also slimmer. Not only is this a boon for those with narrow feet, the more svelte silhouette adds polish, taking the slippers beyond footwear more appropriate for around the house or at the beach. 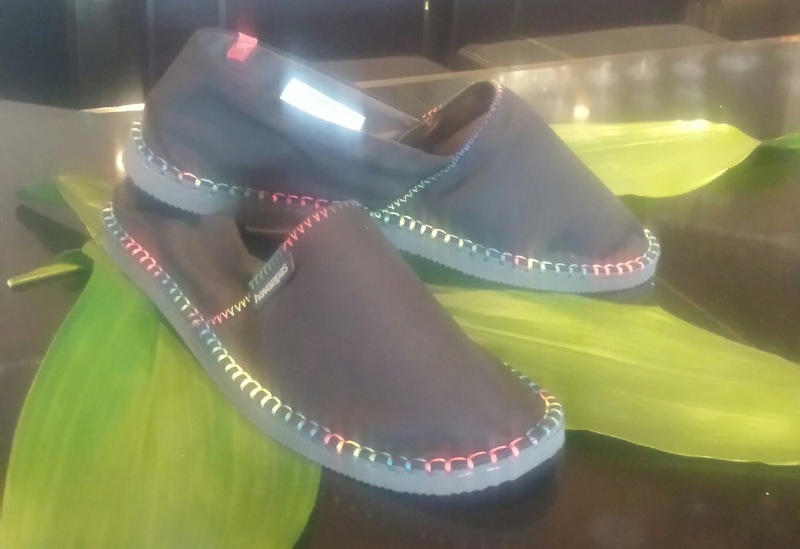 Espadrilles (mens) from the Havaianas Soul Collection. Photo by Yours Truly. The collection comes in 30 colors, including shocking pink, lemon green (solids), beige-pink, yellow-purple (two-tones), and deep purple, orchid rose, pistachio, tropical green, rose gum, ice grey (prints). Visit http://www.us.havaianas.com/ to learn more about the Havaianas Soul Collection, Flat Collection and other lines. A reboot is going on at British shoemaker, Clarks and you, you, you and you want to be a part of it. The Desert Frank designed by Frank Bowling. Photo from Clarks:Rebooted Web site. Visit http://www.clarksusa.com/us/halo-trust-desert-boots to learn more about Clarks: Rebooted; visit http://www.halotrust.org/ to learn more about The HALO Trust.